This post was originally posted in 2014. It was last updated Jan 2018 to maintain accuracy and pertinence. Full 2018 calendar journal templates are available in my Etsy shop. Do you keep a journal? I am the worst journal-keeper ever. I used to be pretty good at it when I was younger – okay, I used to do it when I was younger. Being good at it might be a little too generous. But, then… Life. Marriage. Motherhood. I was so busy living (sometimes surviving) day-to-day that I was sure I wouldn’t forget the important stuff and the daily stuff was monotonous. Did I really need another journal entry about dishes and laundry and baby snot on my clothes? But, I realized that I WAS forgetting the important stuff. Wait, what day was it when my beautiful little niece was born again?! And how much did the doctor say my youngest weighed at his well-baby check up last week? If only I’d written it down! And, you know what, the dishes, laundry and baby snot DOES matter. It might seem like small, inconsequential chores and a boring daily grind – but it’s my life! It’s not always glamorous and fancy, but it’s mine. When I’m feeling unaccomplished and like I spent my day just spinning my wheels, some times I need to account for the little things like laundry and dishes. Because keeping my family fed and clothed IS important. Having a physical list of my accomplishments helps me have the motivation to do it all again the next day. Part of my struggle was time. I felt like I didn’t have time to sit down and write for 20 minutes! And filling only three lines in my journal was kind of depressing. However, I seemed to have stumbled on something that works! A Calendar Journal. I first saw a similar idea on a Flickr feed. The one I originally saw, I can’t seem to locate, but the link is quite similar. I totally fell in love with the idea. THIS I can do! AND I DID! Eleven months down and I only missed a week plus a couple days. It looks so neat and only takes a couple minutes a day (usually right before I go to bed). The good news: I think I’m hooked! The limited space is just what I need. It’s small enough that I don’t feel like I need to spend large chunks of time on writing. I just jot down a few quick notes and I’m done. Some times, I write in it while I brush my teeth at night. Super quick, super easy. It’s also a creative outlet for me and that’s just what I need to wind down and relax at the end of my day. A couple of close-ups of my Calendar Journal. Nothing super detailed or incredibly personal… unless you want it to be. Sometimes, my entries were just a check list of things I’d done that day – dishes, laundry, wiping up baby snot – and sometimes they were more personal – like we’re having another baby! As you can see, I am no artist and the little sketches are just simple little drawings. 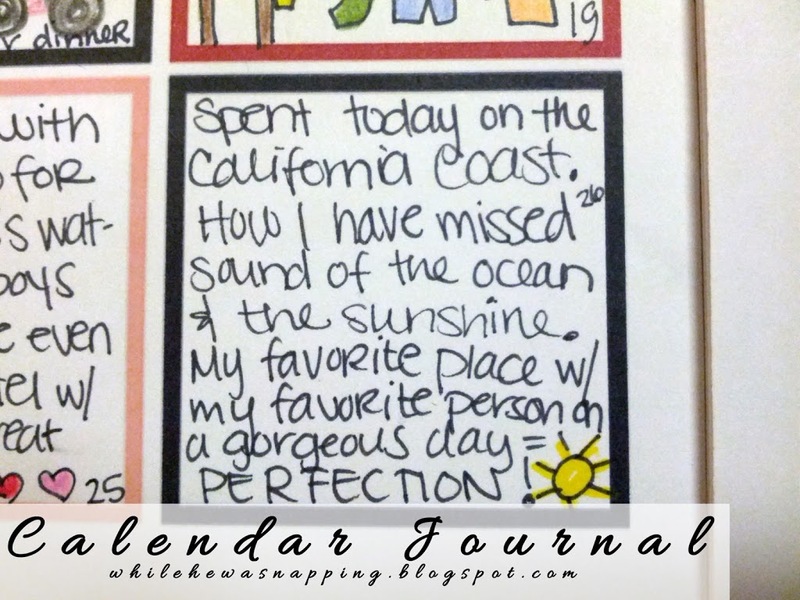 Click the image to view a larger version of my Calendar Journal. 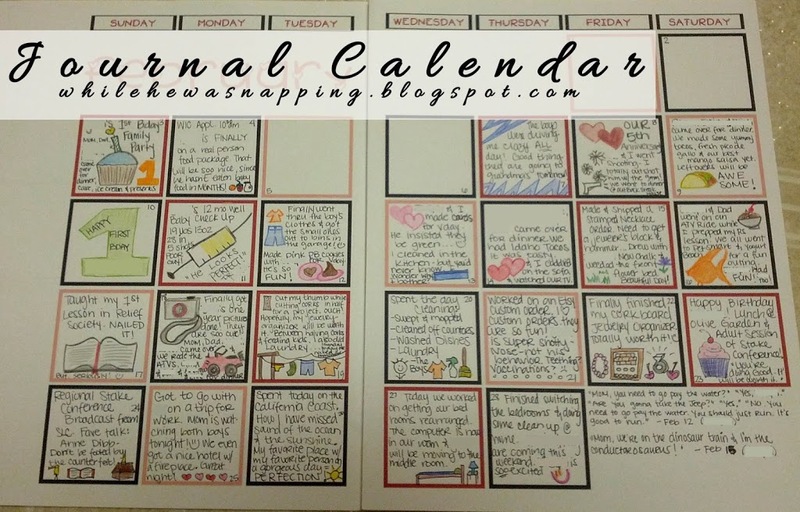 WANT TO CREATE YOUR OWN CALENDAR JOURNAL? I have the 2018 calendars available for purchase in my Etsy shop. It is a one-time, single instant download with all 12 months. The PDF file has all 24 calendar pages and is ready for printing right at home. Another nice thing about the PDF packet is that you will be able to print the pages back-to-back all at one time. Each month also has extra space to write down additional notes. I used it for things my kids said, anything exciting that didn’t fit in the box for that day and little extras (like when my husband surprised me with a new cell phone upgrade). I never got around to binding my pages, they are all still just loose papers, as you can see in the photos above. Some binding ideas are: You could put them in a three-ring binder, bind them with tape and glue or sew them together. UPDATE 2018: I now do my calendar journal in my planner. I used the Mom on the Go Planner from leafytreetops.com last year. I love the weekly spread where each day is split into three columns. I use the bottom box to do my calendar journal and the top boxes are my appointments and to-dos. Any blank calendar or planner would work though. I also really like the Erin Condren Life Planner – it has the three column layout as well. What a great concept! I’m going to try this out and hopefully it will stick since it is so incredibly simple. Also, scrapbooks come in 8.5×11 format. What a great way to save along with pictures mixed in. They do make 8.5×11″ scrapbooks! I love that idea. I know people that have used them with their Project Life books and I think that would look so cool! I love this idea, it’s a great way to commemorate the year. I’ve been doing something similar in my planner. 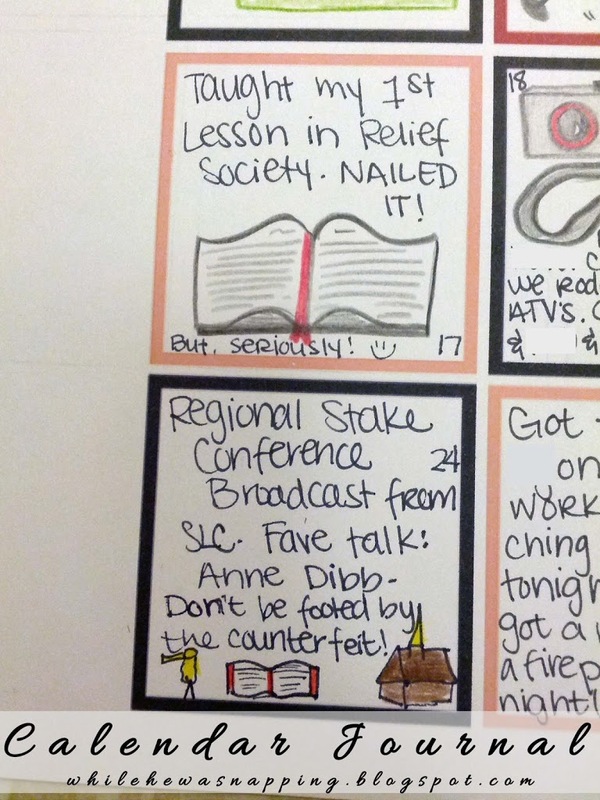 I hope you’ll stop by and link it and 2 other posts with our Small Victories Sunday Linkup!